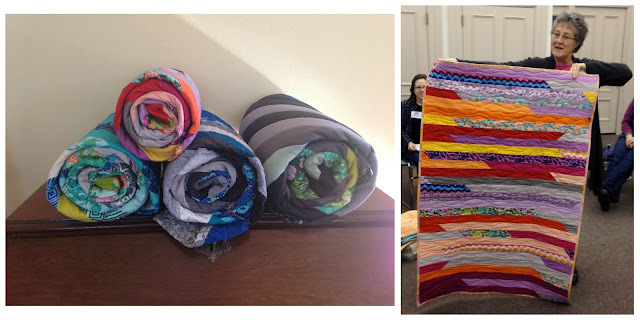 Our great group of quilters loves to put our skills to use for a good cause. --Due at February Meeting: Charity blocks for Thomas Fire: Kelly is collecting blocks to send to Ventura MQG/Superbuzzy for those displaced by the Thomas Fire in CA. Please read more about the Ventura MQG's efforts HERE. If everyone were to make two blocks, we would have enough to send a completed twin sized quilt block. If you would like to participate, please use the Perikomen Valley Block tutorial to make your blocks in shades of jewel blue and grassy green. --The guild is currently in particular need of throw or lap sized quilts in gender-neutral colors (would be enjoyed by a man or a woman). At our October 2015 meeting we held a Jelly Roll Race! There were four teams that divided up several jelly rolls to create four wheelchair quilts that were then taken home, quilted using polyester batting, and sturdily bound for many washings. Two of the quilts were donated to the Rockingham County Nursing Home in Brentwood, NH, and two were donated to the County Center for Health and Rehab in Newburyport MA. The MQG set out a few guidelines for the 2015 challenge. We were given a color palette and asked to incorporate "alternate gridwork" into our final quilt. 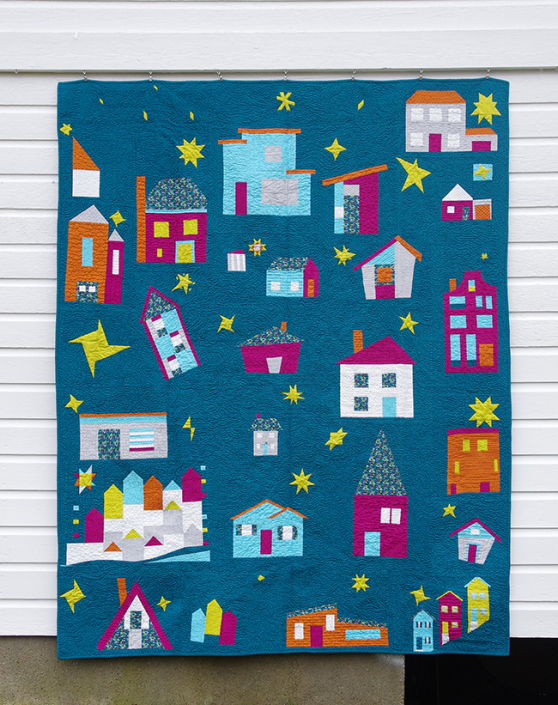 The plan for the quilt design evolved quickly from Stephanie's suggestion of donating the finished quilt to "A Safe Place" (now know as Haven), an emergency shelter for women and children in Southeastern New Hampshire. You can read all about our process in our Spotlight post on the Modern Quilt Guild's blog.